Johnson's Germany No.2. Johnson's Germany No. 3. This is a beautiful example of the western sheets from A. J. Johnson and R. Browning's 1861 Germany series. The map is divided into two separate maps within the same border. The upper map depicts the states of Westphalia, Clevesberg (Rhein Provinces), Hessen Cassel Darmstadt, Brunswick, Schwarzburg, Frankfurt, Waldeck, Reuss, Saxen Coburg Gotha Meiningen, Saxen Altenburg, Weimar and Luxemburg. 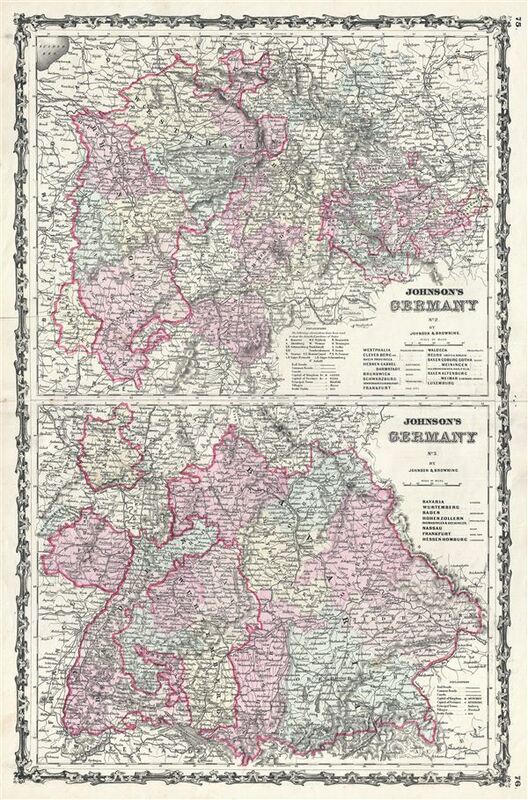 The lower map focuses on Bavaria, Wurtenburg, Baden, Frankfurt and Hessen Homburg. Depicting the large and awkward range of the German Confederation has always been a challenge for Johnson. This is one of Johnson's earliest attempts, dividing the region into four separate maps, Germany 1, 2, and 3, and a separate Prussia sheet. Various towns, cities, railways, rivers and several other topographical features are noted with relief shown by hachure. It features the strapwork style border common to Johnson's atlas work from 1860 to 1863. Published by A. J. Johnson and Browning as plate nos. 75 and 76 in the 1861 edition of Johnson's New Illustrated Family Atlas. This is the last edition of the Johnson Atlas to bear the 'Johnson and Browning' imprint. Subsequent editions reflect Ward's 1862 acquisition Ross C. Browning's shares in the firm. Very good. Typical wear and toning along original centerfold. Minor foxing.